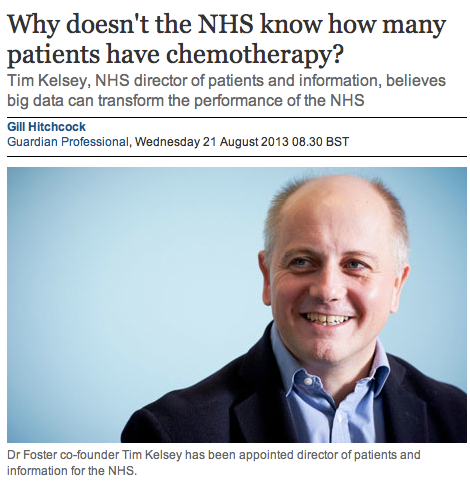 This interview of Tim Kelsey, Director of Patients and Information at the NHS, by the Guardian’s Gill Hitchcock ​seems to be desperately trying to tag onto the hype of “Big Data” but for me it highlights how unquestionably NHS leadership accepts the current status quo in which we are content to tolerate a fundamental lack of effective documentation of healthcare and is prepared to believe that there is some magic Big Data/Digital bullet that will enable us to continue to meet societies healthcare needs with in-office 10 minute consultations. ​I think there’s a major misunderstanding in this article about what constitutes ‘​big data’.​ How many patients have had chemotherapy in the NHS is a distinct number and not something we need big data to solve. It should be obvious to anyone that a single administrator could collect this information in a week by emailing the 160 odd NHS Trusts (Urgent Request: Dear XYZ, David Cameron needs to know in the next 24hrs…) and a ​small Excel spreadsheet file with a SUM function column and you have the answer. 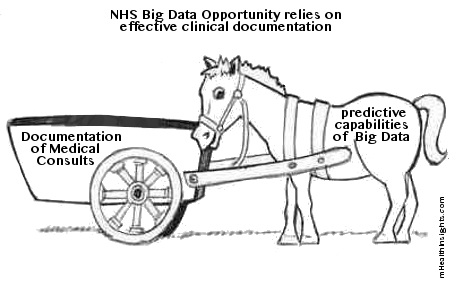 In my opinion the Big Data question​ and opportunity​ is not ​in being able to tell ​how many Patients had ​Chemotherapy but wh​o are the Patients that had chemotherapy, what ​was wrong with them, where were they from, how much chemotherapy did they have, did their consultants think it was a success, did they think it was worthwhile, would they do it again, how did outcomes compare when siblings had chemotherapy, etc, etc. I think that should start with Patients (or their carers) completing clinically validated interactive Patient history taking questionnaires that we use as a part of the documented consultations we offer here at 3G Doctor. To me this doesn’t sound like better use of data but rather getting Cardiac Surgeons to accept the introduction and sharing of a very basic documentation process e.g. how many operations did you conduct and how many of your Patients died? To my mind permitting this to be documented is a very important start but it’s far from the big opportunity and it’s a country mile away from the ‘Big Data’ article title eg. it’s very easy to hide facts in such a simplistic documentation process (the surgeons can just elect to do less risky and/or smaller operations) whereas big data could help us understand and make informed judgements on which surgical approaches to which specific abnormalities get the best results and then to probe the when, where and why. This seems like a great idea until you realise that most of the things you share with your Doctor or Nurse in a primary care interaction are still not documented. For me this highlights a key challenge healthcare professionals have imagining the sweeping impact mobile technology is having on how we access healthcare. People who work within industries that are more advanced in the adoption of consumer technology scratch their heads at how Primary Care still relies on so many secretaries typing letters on PCs, digitally printing them, before then Faxing them to the GP clinic… …it’s slowly becoming obvious that the rest of the modern world – even 93 year olds! – don’t think your ‘digitised’ because you offer the ability to book ‘a prescription online’ (read this post to learn about how the private sector is already making hundreds of millions in revenue from their understanding that Patients don’t need to be ‘online’ to order a prescription). When innovation is quicker at the telecom regulator it should be obvious that it’s time to scrutinise exactly what you’re investing in. Chicken and egg here: Without documentation of care how do we expect Patients to ever know when and where they can be “more demanding”? It’s only a very small minority of patients or carers that have the confidence to challenge the authority of their healthcare providers (or would be prepared to run the risk of being labelled a ‘Mrs A-Type personality’). Undocumented consultations contribute to this issue because (unless you’re a Healthcare Professional) you will be unfamiliar with what it is you are being called on to be more demanding about and you can’t easily ask others for their advice (because you can’t share the details of what’s been said/done). I think this take-away really underlines my disagreement with this article: in 2013 we should learn to walk before we try to run and we should shift the focus from the quality of the data to ensuring that the care we are providing is being effectively documented in the first place. It’s not even a question of trust because Patients can’t begin to appreciate the value of ‘Data’ to them as when they read the papers they learn of the UK Government’s plans to sell this off to Private firms for as little as £1 (while asking them to pay as much as £50 for the same). ‘Documentation’ of encounters with Medical Professionals is very different as the value is easy to appreciate because you automatically get a copy of the important medical information that your treatment is based upon – just like you get when you avail of any other modern service eg. shopping on main street (a till receipt), buying goods online (paypal email), ordering something on the phone (letter in the post), etc. The NHS also has to realise that documentation must not remain some exclusive entitlement we give to Healthcare Professionals as this provides one of the biggest opportunities we have today to learn about and recognise symptoms of disease. At the moment the data that is stored is all too often just the Doctors interpretation of the story and what they personally feel is important or relevant. The result of this is that we’re forever losing important symptom information because Doctors are able to simply dismiss something as unimportant and not worth documenting or because they don’t understand it or recognise it as a part of the pattern that they are thinking about, etc.